Make time for a few family outings this season. Fall is a season of change that speaks to the senses…the crunch of leaves, the kaleidoscope of colors, the coolness of the air. The impending holidays invite togetherness and create the perfect setting for family activities. 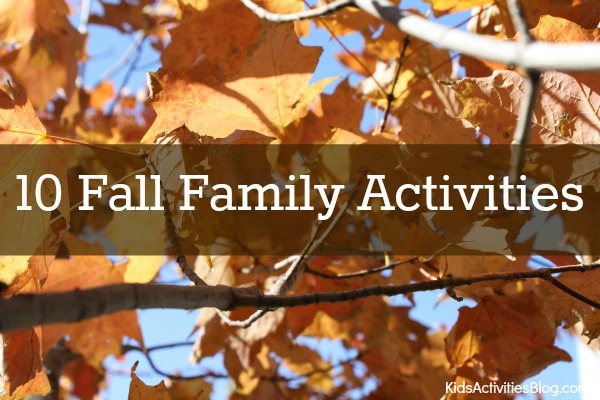 Kids Activities Blog is excited to share these ways you can strengthen family bonding while exploring the richness of fall. 1. Go on a nature scavenger hunt. Create a list beforehand of what items you’d like to see on your walk. Some list ideas are: leaves of different colors (red, yellow, orange, brown), a tree with no leaves, squirrels, a scarecrow, rakes, pumpkins, acorns, etc. 2. Collect leaves, acorns, and twigs and create a fall centerpiece for the family table. 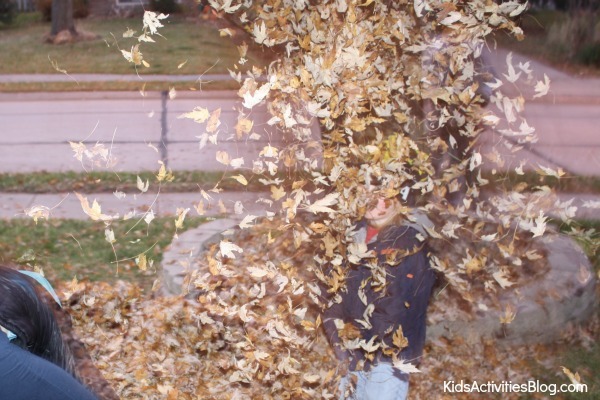 3.Make a leaf pile and take turns jumping in it. 4. Decorating pumpkins doesn’t have to be just for Halloween. Check out your local pumpkin patch or farmer’s market for pumpkins. Use paint and paper to create turkeys out of them. 5. Have your own Thanksgiving Day parade. Each family member can dress up in a costume (whatever, they’d like) to march around the house in. 6. Use at least one item of clothing from each family member to create a scarecrow to display in your front yard. 7. 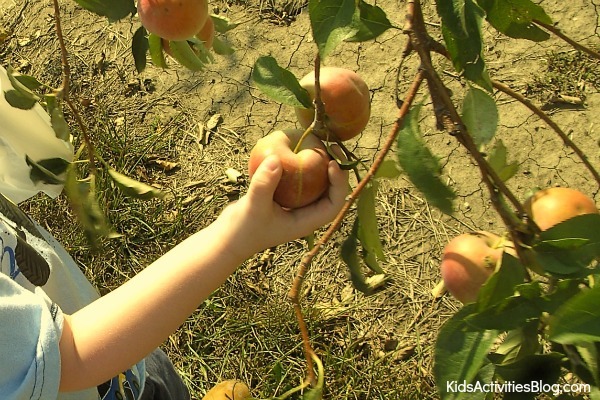 Find a local apple orchard and go apple-picking. Work together as a family to make an apple pie, cinnamon apple crisp, or caramel apples. 8. Trace and cut out your family’s handprints on fall-colored paper. Glue them around a donut-shaped paper plate to create a family fall wreath. 9. Mix up some homemade yellow, orange, brown or red playdough. You can add cinnamon or nutmeg for an autumn scent or crunch up leaves to add texture. 10. Take a drive to a local rural area and enjoy the scenery. Pack a picnic lunch to enjoy while you’re there. Aside from these activities, there are so many more ways to enjoy fall as a family, whether it be crafts, service projects, or just reflecting on what you’re thankful for. Family Activities: Visit a Farm! Andie Jaye is a former preschool teacher turned SAHM of two kiddos. Her blog, Crayon Freckles, is an eclectic mix of play, art, and learning activities. Mingled in are her perspectives on being a crunchy momma, having a long-haired hippy boy and using follow-your-gut parenting. See more of Andie on Crayon Freckles' Facebook page, on Pinterest or on her parenting teens site Why Does My Teen?